From poachers to stagecoach robbers, soldiers were kept busy enforcing the law in Yellowstone. There were five stagecoach robberies in Yellowstone, with the last occurring on 1914. What is often considered the greatest stagecoach robbery of the twentieth century occurred on August 24, 1908, about three miles east of Kepler Cascades, when a single robber held up 17 coaches with 174 passengers. He netted a total of $2,094.20 in cash and jewelry and was never caught. 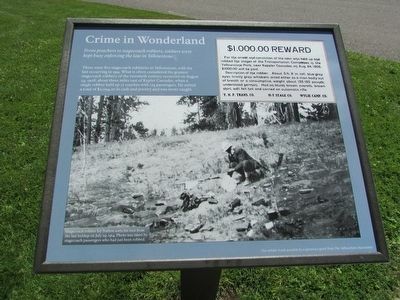 For the arrest and conviction of the man who held up and robbed the stages of the Transportation Companies in the Yellowstone Park, near Keppler Cascades, on Aug. 24, 1908, $1000.00 will be paid. Description of the robber: About 5 ft. 8 in. tall, blue gray eyes, bristly gray whiskers, acted either as a man badly out of breath or a consumptive, weight about 135-150 pounds, understood German. Had on bluish brown overalls, brown shirt, soft felt hat and carried an automatic rifle. Y.N. P. Trans. Co. M-Y Stage Co. Wylie Camp. Co. Location. 44° 58.453′ N, 110° 41.894′ W. Marker is in Yellowstone National Park, Wyoming, in Park County. Marker is on Officers Row, on the right when traveling north. Touch for map. 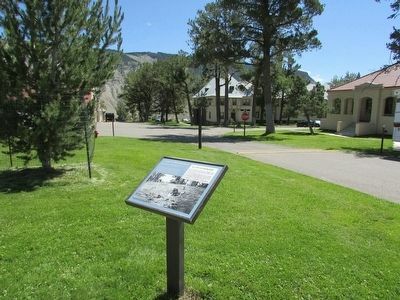 Marker is located in the Mammoth Hot Springs Area of Yellowstone National Park, at Fort Yellowstone. Marker is in this post office area: Yellowstone National Park WY 82190, United States of America. Touch for directions. Other nearby markers. At least 8 other markers are within walking distance of this marker. A Most Fortunate Thing... (was a few steps from this marker but has been reported permanently removed. ); Guard Duty (about 300 feet away, measured in a direct line); At Guard (was about 300 feet away but has been reported permanently removed. ); A Sense of Community (was about 400 feet away but has been reported permanently removed. ); A Soldier’s Life (about 400 feet away); a different marker also named A Soldier's Life (was about 500 feet away but has been reported permanently removed. ); a different marker also named A Sense of Community (about 500 feet away); A Good Duty Station (was about 500 feet away but has been reported permanently removed. ). Touch for a list and map of all markers in Yellowstone National Park. Related markers. Click here for a list of markers that are related to this marker. 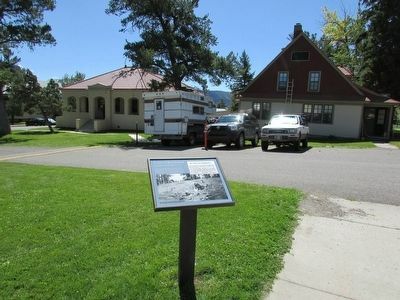 See all of the markers on the Fort Yellowstone walking tour. More. Search the internet for Crime in Wonderland. Credits. This page was last revised on September 11, 2018. This page originally submitted on August 13, 2015, by Bill Coughlin of North Arlington, New Jersey. This page has been viewed 245 times since then and 4 times this year. Last updated on September 10, 2018, by Craig Baker of Sylmar, California. Photos: 1, 2, 3. submitted on August 13, 2015, by Bill Coughlin of North Arlington, New Jersey. • Andrew Ruppenstein was the editor who published this page.